“The Captains’ Return,” 2006, located in St. Louis, Missouri, Courtesy of the sculptor, Harry Weber. It has been more than two hundred years since Meriwether Lewis, William Clark, and their crew began an unbelievable journey across North America. They faced numerous trials and hardships. They traveled in all types of inclement weather and over all kinds of harsh terrain. They went through periods of sickness and starvation, and sustained countless injuries, yet somehow they survived. The whole of the party who accompanied me from the Mandans have returned in good health, which is not, I assure you, to me one of the least pleasing considerations of the Voyage. A month later Jefferson received Lewis’s letter and responded with great joy and relief at the expedition’s safe homecoming. 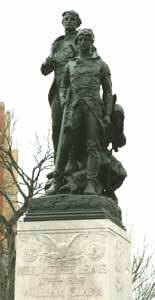 Statue of Meriwether Lewis, William Clark, and Sacagawea by Charles Keck, 1919, located in Charlottesville, Virginia. Following their return, the men who formed the Corps disbanded. Lewis and Clark received a hero’s welcome and government positions. Their men were given double pay and 320 acres of land for their efforts. Some of the men went home, married, and farmed. For others the lure of the frontier was too strong to resist. At least seven men went back into the wilderness as fur traders. Four of these men later died in Indian attacks, three others narrowly escaped such assaults. The most dramatic story involved John Colter and John Potts, both fur traders who were attacked by Blackfeet Indians. Potts was killed. Colter, stripped of his clothing, outwitted his pursuers by hiding under driftwood in a river. He hiked for eleven days crossing two hundred miles until he stumbled upon a trading post. Colter then became the first white man to describe the steaming geysers in Yellowstone National Park. In 1852, Alexander Hamilton Willard again crossed the continent, this time in a covered wagon with his family. Patrick Gass was the first to publish a journal of the Lewis and Clark Expedition in the year following its return. He served in the War of 1812, wanted to enlist to fight in the Civil War, and died in West Virginia in 1870 at age 98 when he was the oldest surviving member of the Corps of Discovery. George Shannon was only 18 years old and the youngest member of the Corps. He was lost twice on the expedition, once for 16 days when he nearly starved to death, and another for three days. He studied law and had a practice in Lexington, Kentucky. He died in Missouri in 1836. Map of Northwestern United States by William Clark. Courtesy of The Albert and Shirley Small Special Collections Library, University of Virginia Library. William Clark’s map depicting the terrain and topography of the West was a ground-breaking accomplishment. The information he collected prior to the expedition’s travels indicated that only 1350 miles separated the Mandan villages from the Pacific Ocean. In reality the distance covered by the Corps was 2550 miles. On the journey west, Clark estimated distances and took compass readings at every change in direction. He used this data plus information that he gathered from fur traders and Native Americans to compile his map that was over four feet wide. The West, once daunting and intimidating, was now a more familiar place to Americans. In addition to Clark’s accurate map the Corps of Discovery introduced 178 new plants and 122 new animals to science. They encountered Native American tribes and described their ethnology. Jefferson declared that it would take at least one hundred generations to settle the vast expanse of the West. Instead, Americans, hungry for the prosperity it promised them, populated it within five generations. Settlers dug up prairie land and turned it to farmland; the vast herds of buffalo were decimated for sport; and grizzly and elk retreated to the farthest reaches of the mountains. Native Americans, too, felt lasting effects from the Lewis and Clark Expedition. Lewis and Clark promised them that the United States government was their friend. Instead the government betrayed them innumerable times by taking their land and breaking treaties. White man’s diseases, in particular smallpox, devastated the populations of Mandan, Arikaras, and Hidatsa, all tribes that were friendly and hospitable to the Corps of Discovery. Meriwether Lewis, William Clark, and the other explorers, achieved an extraordinary feat. Because of their expedition, however, the West that they experienced would never be the same.